Score another point for the girls! With so many high profile releases in the past two weeks, the album I find myself playing most often on my iTunes is? 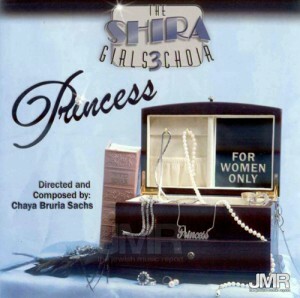 Princess, the third album from Baltimore’s wildly successful Shira Girls Choir. Sorry, guys you read that right. I have gotten six new releases in the past two weeks and my favorite comes from a bunch of girls who live south of the Mason Dixon Line. While it is the boy’s choirs and groups that capture all the hype and hoopla for numerous reasons, there is one area in which the girls beat the boys hands down. Girl’s choirs have the advantage of being able to include older girls in their ranks, given that there are no voice changing issues in the female segment of the population. There is definitely something to be said for a choir that is capable of including high schoolers of all ages, which adds a level of both maturity and complexity that boys of even 8th or 9th grade simply can’t touch. But it isn’t just an age thing that makes Princess so good. It is that talent isn’t a gender based thing. Chaya Bruria Sachs who directs the choir, composed all the songs, some of which are amazingly good. There are some terrific voices in this choir and when it came to musicians and arrangements, she went to the same professionals that everyone else uses by filling in the vocals after talents such as Yisroel Lamm, Yaron Gershovsky, Avi Singolda, Yochi Briskman, Yanky Briskman, Steve Bill and Jim Hynes, to name just a few, did their things. Like on the previous two SGC albums, there are beautiful songs here, augmented by some really stunning voices. Featuring ten songs and clocking in at a little over an hour, Princess has some very memorable musical moments. Sorry guys, there are some drop dead gorgeous vocals and truly exquisite harmonies here and you can’t listen to any of them. My only regret is that the soloists aren’t named in the album so that I know who I am listening to. Bamarom – a breathtakingly stunning slow song that is so gorgeous that even at 7:38 I still wish the song would go on. Yerushalayim – another truly magnificent slow song. There is something magical about the words “Habotchim BaHashem k’har tziyon”. How is it that every song with these lyrics ends up being a winner? Kol B’Rama – Again, another set of lyrics that somehow always hits the bullseye for me, and SGC doesn’t fail to deliver on this slow song. Olam Haba – In case you thought I only liked the slow songs, this opener at again over 7 minutes long disproves the theory that “less is more”. This leibidic song is good enough to keep going for that long without every getting boring or predictable. The perfect way to open the album! Avromi’s Song – the first time I heard this song, which is very complicated musically, I wasn’t quite sure what it was all about. From a musical standpoint, it reminded me of a song that the choir heads would sing at a high school concert – complex, beautiful and laced with meaningful messages. Lyrically, I wasn’t quite sure what I was listening to. The liner notes, explained it all. Composed in memory of Avromi Sachs who was niftar at age 6, it was originally played at a fundraiser for Avromi’s yeshiva in Baltimore, one year after his petira, accompanied by a slideshow. The song is dedicated to all the families who have lost young children. Armed with that knowledge I went back for another listen and this song just blew me away for its bravery and optimism in addition to the sheer beauty of the music. A special yasher koach to Chaya Bruria Sachs for sharing the story of her son with us in such a meaningful and insipiring way and for taking her story public for the benefit of others. Could anyone listen to 8 year old Miri Sachs singing about her older brother and not be moved? I doubt it. Princess – While this song didn’t make my top five on the album, it gets honorable mention for delivering an important message about tzniyus and k’voda bas melech pnima to girls everywhere in a way that is never preachy or heavy handed, but instead reminds them just how valued and special they are.